UNDATED - For the week ending Sunday, spring wheat and oat harvests neared completion following a mostly dry week, according to USDA's National Agricultural Statistics Service. Temperatures were average to above average for a majority of the State, as daytime highs climbed into the upper 80s and lower 90s for many central and western locations by week's end. Corn maturity ratings remained behind last year and average as producers prepared for harvest. There were 5.9 days suitable for fieldwork. Topsoil moisture supplies rated 19 percent very short, 26 short, 54 adequate, and 1 surplus. Subsoil moisture supplies rated 27 percent very short, 34 short, 38 adequate, and 1 surplus. Spring wheat harvested was 97 percent, near 93 both last year and for the five-year average. Oats harvested was 95 percent, behind 100 last year, and near 99 average. Barley harvested was 60 percent, well behind 95 last year and 91 average. Corn condition rated 10 percent very poor, 16 poor, 32 fair, 38 good, and 4 excellent. Corn dough was 90 percent, near 94 last year and 93 average. Dented was 43 percent, behind 62 last year and 60 average. Corn mature was 1 percent, behind 8 last year and 9 average. Soybean condition rated 6 percent very poor, 13 poor, 33 fair, 42 good, and 6 excellent. Soybeans setting pods was 97 percent, near 98 both last year and average. Dropping leaves was 17 percent, behind 24 last year and 26 average. 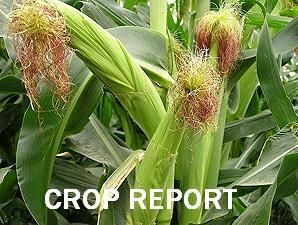 Sorghum condition rated 14 percent very poor, 16 poor, 56 fair, 14 good, and 0 excellent. Sorghum headed was 97 percent, near 98 both last year and average. Coloring was 42 percent, well behind 75 last year and 69 average. Mature was 6 percent, behind 17 last year, and near 8 average. Sunflower condition rated 6 percent very poor, 21 poor, 49 fair, 22 good, and 2 excellent. Sunflowers blooming was 95 percent, ahead of 81 last year, but equal to average. Ray flowers dried was 34 percent, near 31 last year, but behind 41 average. Bracts turning yellow was 6 percent. Bracts turning brown was 1 percent. Alfalfa condition rated 30 percent very poor, 37 poor, 20 fair, 13 good, and 0 excellent. Alfalfa second cutting was 78 percent complete, behind 84 last year and 95 average. Third cutting was 47 percent, behind 64 last year and 61 average. Pasture and range condition rated 29 percent very poor, 27 poor, 28 fair, 16 good, and 0 excellent. Stock water supplies rated 21 percent very short, 31 short, 47 adequate, and 1 surplus.